The tube-exploring grannies are back, and they've changed from black to grey (tube line colours...not their hair). If our parenthetic comment sounds a bit cheeky, it's because we feel we've got to know Carole and Judy, having enjoyed their repartee during adventures on the Northern and now Jubilee Lines. Their idea is simple: visit every station on the Jubilee Line, see what there is to see in the surrounding area, then find somewhere for a re-energising cup of tea. 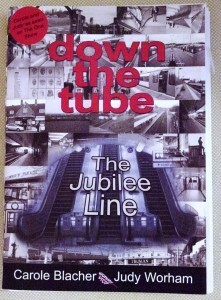 The whole thing's written as one big conversation between two old chums, which gives it a very different flavour to the zillions of other recent tube-themed books. The pair are both retired teachers, and as such have no qualms about asking questions of security guards and poking their noses into interesting places. We're pretty sure they taught us something new about every station, even though we lived on the Jube for the best part of a decade. With bonus chapters on the Jubilee Depot, Emirates Air Line and the 2012 Olympics, this is a rib-tickling sequel and a good warm up for when they eventually tackle the 60-station District Line. Buy direct from Worbler Press. 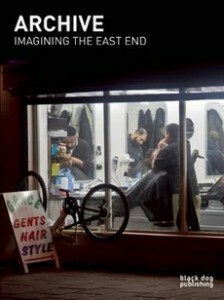 This sumptuous photographic book contains 16 panoramas from around London. 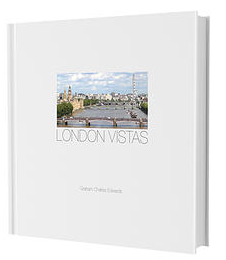 It includes classic views, such as from Greenwich Park and Bankside, but also captures the capital from lesser photographed spots such as Queenstown Road and Lord Archer's penthouse on Albert Embankment. The shots are beautifully presented. Each panorama folds out to fill four glorious pages. Such is the pace of change in London, that some panoramas already offer historic interest. For example, you can relive the view from Parliament Hill before the Shard, Heron, Cheesegrater, Walkie-Talkie or Broadgate Towers intruded upon the skyline, a shot that must have been taken half a decade ago. All in all, a spellbinding representation of the capital that will fascinate even more as time goes by, and we look back on this book from a city that has shifted and developed in ways as yet unknown. Buy direct from the author. The Sir John Cass Faculty of Art, Architecture and Design — better known as The Cass — recently released an archive of photographs from the East End. The archive brings together bodies of work from historic and contemporary sources and includes both documentary photography and more artistic works. This book serves as an excellent introduction to the project. It examines the work of around a dozen of the contributing photographers. We particularly liked Susan Andrews' shots, taken from wherever her car stopped in traffic during a daily commute along the Whitechapel Road. David Howell's deductive, Sherlock-esque interpretations of found photos of 1970's Whitechapel are an absolute joy (can we have a whole book of these, please?). Michael Upton's Paralympic portraits offer a more contemporary slant. This is a highly accessible and inspiring introduction to the archive, and never sinks under the specialist terminology and ideas that can sometimes hamper the casual reader's appreciation of such projects. Buy direct from Black Dog Publishing. We don't normally review books for London's youngest inhabitants. After flicking through this glorious playbook, we'll have to correct that oversight. Hello! 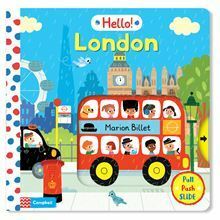 London, from Campbell Books, is a colourful, sturdy intro to London for pre-schoolers, and part of a series that includes similar books on the London bus and London taxi. Cunning levers and dials let your nipper raise Tower Bridge, open the Tube doors, rotate the London Eye and even make the Royal Family appear on Buckingham Palace balcony. A quick opinion poll of people in our office (none of whom have kids) concludes that Hello! London is "a lot of fun", "wipe clean for errant dribbles", and "a handy size for tw*tting younger siblings". Hmm, maybe we should stick to reviewing adult books. Buy direct from Campbell Books. See more London book reviews, our pick of the top books of 2013 and London's independent bookshops, mapped.